Week 5 of the 2018 NFL season produced another slate of thrilling matchups, including three games that were decided by field goals as time expired. One play, one stop, one pass breakup or one pressure in an opportune, high leverage situation often makes the difference between a win and a loss in today’s NFL landscape, so let’s highlight some of the players on the defensive side of the ball who stood out and made a difference in Week 5. The Steelers defense has been much maligned in 2018, with promising second-year man T.J. Watt even taking a step back over the first quarter of the season. That changed in Week 5, with the team only giving up 17 points and T.J. extending the streak of defenders with the surname Watt making this list to three weeks in a row, following in older brother J.J.’s footsteps. Outside of a phantom roughing the passer penalty, which we won’t hold against him, Watt finished a banner day with three sacks and a league-leading seven defensive stops (solo defensive tackles made which constitute an offensive failure). The culmination of his efforts being a strip-sack turned touchdown late in the fourth quarter. The slugfest between the Titans and Bills in Buffalo was certainly a defensive-oriented affair. 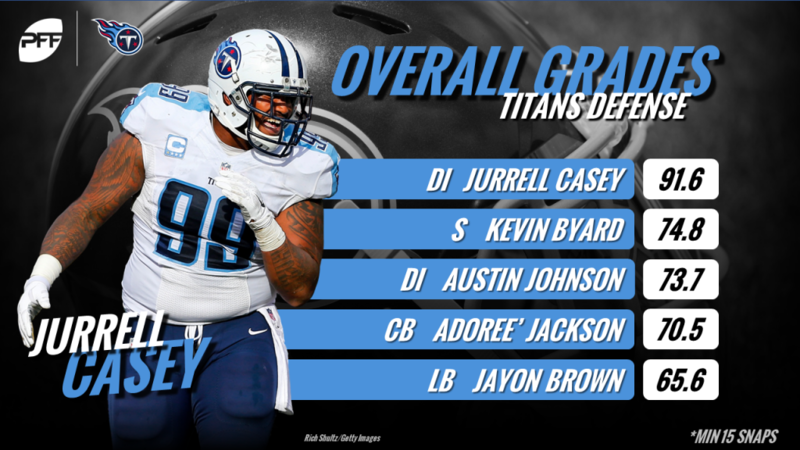 Jurrell Casey has been a remarkably steady contributor to the Titans defense, finishing with a top-15 overall grade amongst interior defensive players every year of this seven-year career. In that vein, Week 5 was just another day at the office for Casey, where he made most of his difference slowing down Buffalo’s run game, ending with four defensive stops and two tackles in the Buffalo backfield, despite being the target of constant double teams. Like Watt, Jones is another defender who was off to a slow start this season compared to the high expectations attached to the veteran safety. On Sunday, he showed in all phases, defending two passes and allowing only one catch for negative-two yards in his coverage while collecting four defensive stops and one quarterback hurry from a blitz. Another defender surely to boost his season grade after a disappointing start, Trufant was excellent in coverage all afternoon. Big Ben threw at him very selectively, and regretted whenever he did, as Trufant allowed zero of the four passes thrown into his coverage to be caught. He broke up two passes on the day and even added two run stops in the process. 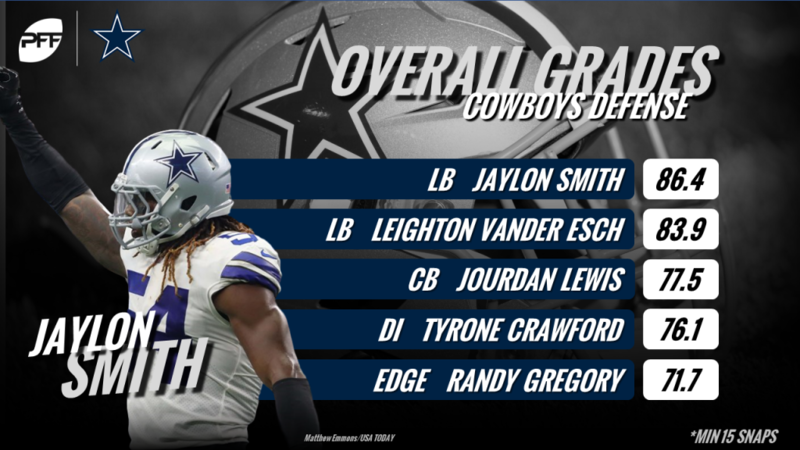 Certainly not a surprise to see him in this space, Cox entered the week as PFF’s second-highest graded interior defensive player, after Aaron Donald. Despite the losing effort, he left his mark on Kirk Cousins, hitting him four times and hurrying him once more. Cox’s teammate was even more productive rushing the passer with his sack, two hits and four hurries giving him a pass-rushing productivity of 15.3 across his 36 pass-rush snaps. The Eagles moved him around the formation with 18 snaps from the left side and 18 from the right side. Five of his seven total pressures came from the left side when lined up against right tackle Rashod Hill, whose pass blocking grade was accordingly affected. Geno Atkins makes the Sunday Standouts list for a second week in a row. Atkins entered the week as PFF’s fourth-highest graded interior defensive player and only continued his excellent play on Sunday. His play was a big factor in Cincinnati’s 17-point comeback victory. His six total pressures (two sacks, one hit, and three hurries) gave him a pass-rushing productivity of 19.2 to go with his one stop in the run game. First-year Jets linebacker Williamson had a solid 2017 campaign in Tennessee, where he led the league in PFF’s run defense grade amongst off-ball linebackers. This week he contributed two tackles and a stop in the run game, along with five tackles and two stops in the passing game, missing zero tackles on the day. Another free agent addition for the Jets with a strong game in the victory over Denver. On the day, Claiborne recorded three pass breakups, allowing four of nine passes in his coverage to go for 47 yards, allowing an NFL Rating of 60.9. Claiborne was also a sure tackler adding stops both in the running and passing game, not missing any tackles. The remarkable comeback from a brutal injury suffered at the conclusion of his celebrated Notre Dame career seems to have hit full stride. Smith finished the night with four stops in run defense and two more while in coverage. He was flying around all over the field and did a fine job mirroring Texans quarterback Deshaun Watson when tasked with such, bringing him down for a sack on the Cowboys’ last defense play before halftime.